I was told by a friend that the first time I published this recipe, I did not give enough instructions (horrors), so I am re-blogging it with more photos and advice. This is the most popular birthday cake on my husband’s side of our family. 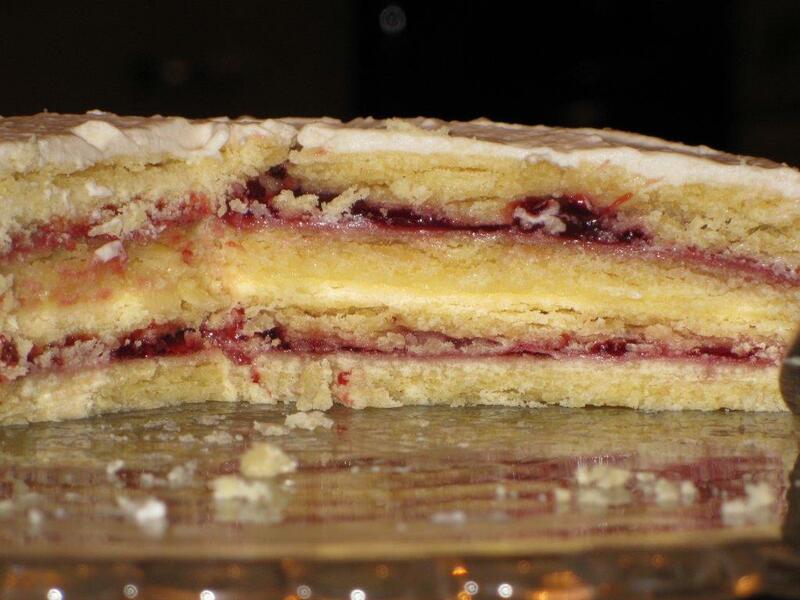 It is not technically “cake”, but rather tender cookie layers separated by custard and jam and topped with whipped cream. Although children can eat a slice of the cake on someone else’s birthday, they cannot have one for their own birthday until age 16. That is the tradition started by my husband’s grandmother. Personally, I think it is because his grandmother was clever and cut the number of times she had to make this delicious, but multi-step cake by 5 grandchildren x 15 years, which is 75 cakes! Children got to taste and to anticipate and eventually to arrive at this rite of passage. Until then, she made one-step cakes for simpler palates. 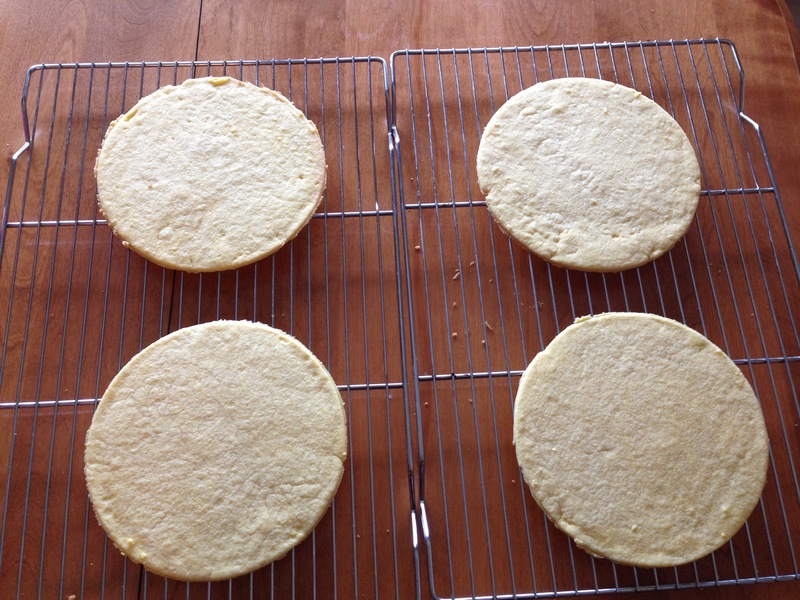 Split into 4 portions and roll flat to 8” rounds on parchment. 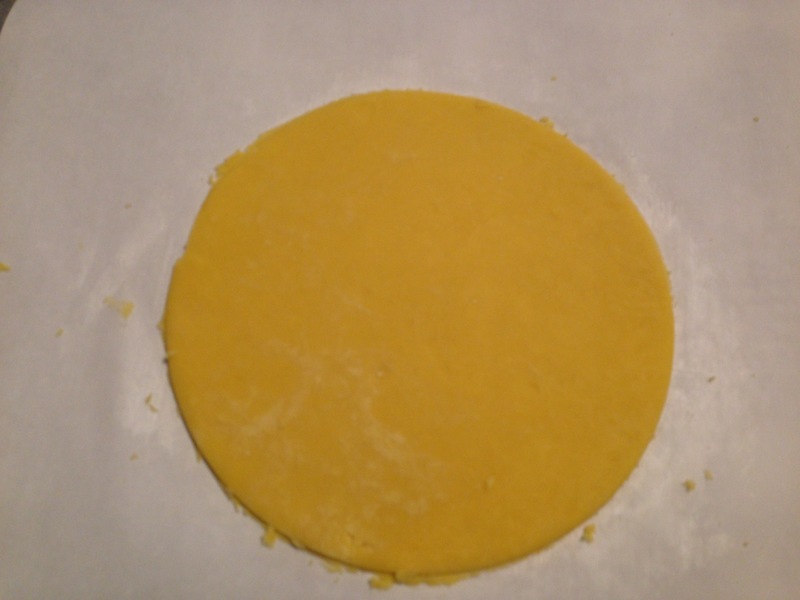 If you don’t roll dough perfectly round, cheat a bit by using a pot lid like a giant cookie cutter. 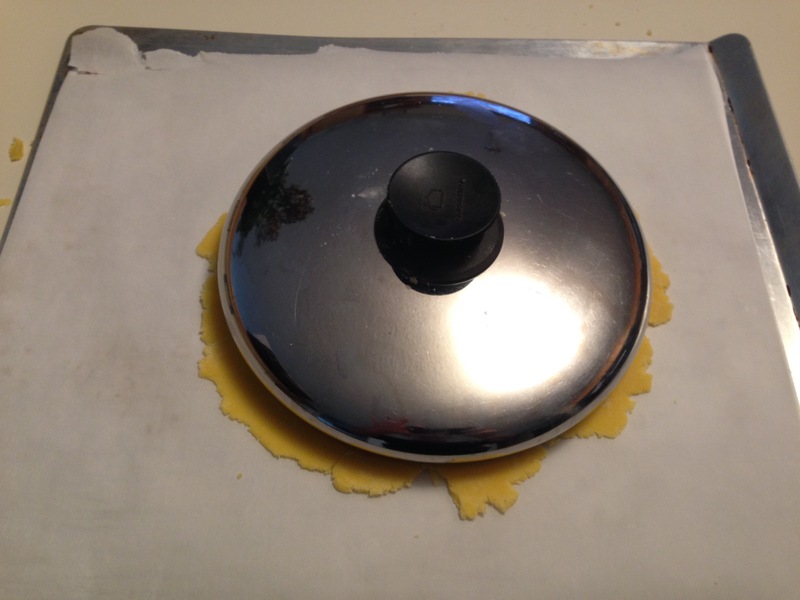 Move parchment to upside-down cookie sheet (or use one without rims). Carefully transfer bottom layer to serving plate. Cover bottom layer with raspberry jam. Place second layer. 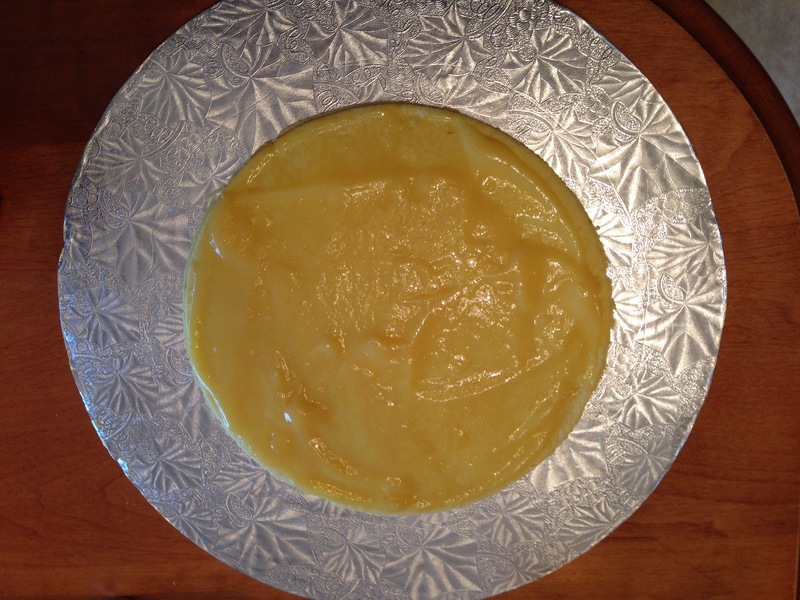 Smooth on custard (Grandma made hers, but I use Bird’s). Place third layer. Cover with jam. Top with last layer of shortbread. 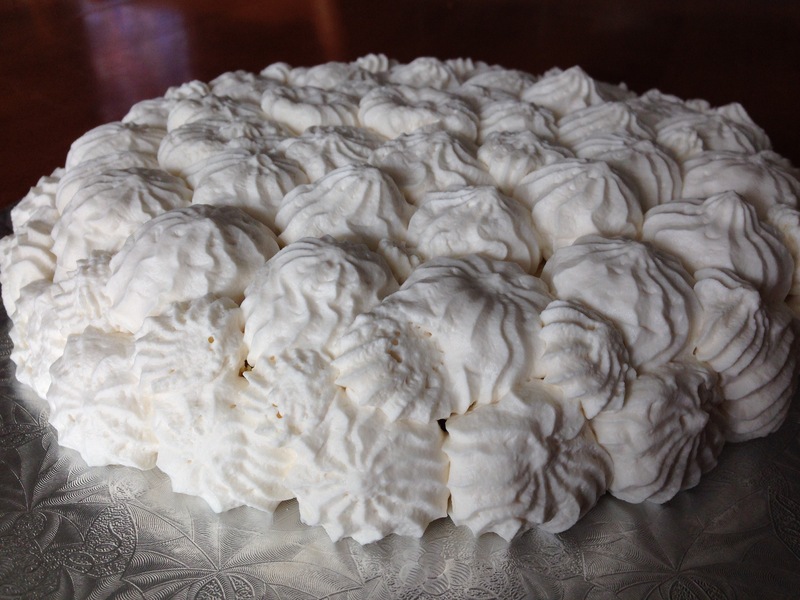 Cover with whipped cream (sweetened with a spoon of sugar and a bit of vanilla). I used a piping bag to apply the whipped cream this year, but last year I did not so the photos at the beginning and end of the blog are different. Choose as you like, depending on how thick you like your layer of whipped cream. 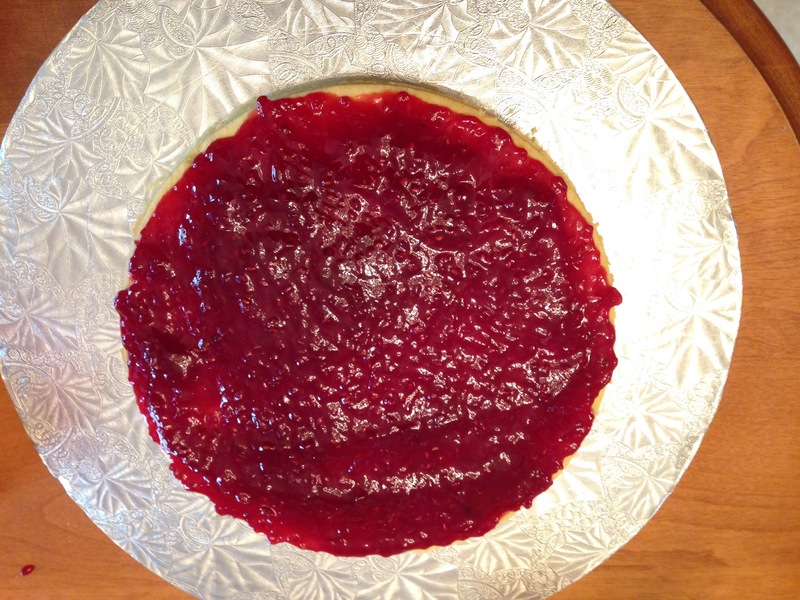 This cake is best if it stands a day or two before serving as the jam and custard soften the cookie layers. That looks soooo good. Your husband’s grandmother was very clever! That would be a ton of cakes. I make a three layer chocolate cake with whipped cream filling and chocolate buttercream frosting for birthdays only. It’s just too much work. We all really look forward to that cake. That sounds delicious. There is something extra special about the foods we reserve for specific days. You’re so right about that. My daughter’s favorite holiday is American Thanksgiving. We go all out and plan for it maybe a month in advance. It’s always so good. She’s back in Canada for school now but she made dinner for her roommates on American Thanksgiving last year. I have always liked Thanksgiving. It is a simple concept, and reason for a good feast! This looks incredible! I’m entering my family’s birthday season, and this is definitely going to be one of the cakes! I love the idea of using shortbread for cake layers. Brilliant. I am so pleased to hear that it excites you! Good luck with it!